It was fitting that the final match of the Gaynor Cup in Cincinnati was truly the best match of the tournament. It was filled with a talented array of shot-making, ridiculous dives and twists in the score line that provided the packed house with intense drama only seen in live sporting events. 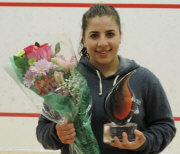 Zeina Mickawy went into the match as the underdog against top seed Kanzy El Defrawy, despite knocking out the second and fourth seed on route to her first PSA 10K final. Zeina surprisingly took the first game, with her powerful hitting and unpredictability of shot selection giving Kanzy all sorts of problems and a difficulty to find a rhythm. Kanzy levelled the match winning the second but it was still not the fluid performance we had come to expect due to the pressure being applied by her opponent. At 10-8 Kanzy produced the first of several dives of the night after being wrong footed, but she still somehow won the rally and let out a primal scream that showed how much the game meant to her. Zeina was only shaken but not stirred as she retaliated fiercely in the third. She controlled the points and the outcome was largely due to her hitting a winner or striking the tin, which was clearly occurring too much for her liking. The pace was frantic and Kanzy looked out of answers as she hung in rather than dictating play. At 6-2 down in the fourth and with Zeina playing with such confidence, it looked as though the possibility of back to back PSA tour victories was out of Kanzy’s grasp. Two quick tins from Zeina, that may haunt her when she looks back at the match, seemed to spark a revival in our top seed and then a rally which featured three dives showed that Kanzy was not going to throw in the towel just yet. 6-2 up turned to 6-9 down and a reinvigorated Kanzy was heading to the fifth. There was nothing to separate the two tied 6-6, as the rallies extended and the quality of finishing points increased. Both players were clearly tired but in full focus as the crowed were fortunate to witness squash at its finest. The walls were frequently leaned on for support after gut wrenching rallies as both players left everything they had on the court. Kanzy produced a great lob off a dive to go 9-7 up and then a tinned crosscourt nick effort from Zeina off the return of serve made it 10-7 and seemingly game over. Dramatically and fittingly, Zeina found a way back, and with the score tied at 10-10 the crowd were raucous as they cheered on the exhausted players. Zeina hit a winner to get her first match ball at 11-10 before Kanzy scrambled to save it and then hit another gutsy kill shot to save match ball and take us to 12-12. With nothing left in the tank, Kanzy rolled a crosscourt nick return of serve, and then closed out the match with another short winner that ended a final where it was a shame there had to be a loser. The biggest cheer of the night may have been for Zeina as she returned to the court for the post-match interview as the crowd showed appreciation for her contribution to a phenomenal match. 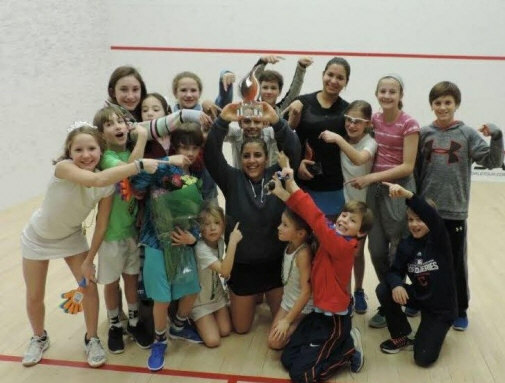 Kanzy, with her minions consisting of all the club squash rats in tow, accepted the Gaynor Cup graciously and paid tribute to her rival for producing maybe the match of her life. Kanzy El Defrawy and Zeina Mickawy will face off in an all-Egyptian championship match of the inaugural PSA Gaynor Cup, after both winning in straight games in their respective semi-finals. Eighth seed Mickawy, who knocked out the second seed in the previous round, was the first into the final. She played with aggressive pace on the ball to gain control of the tee and then used her backhand volley to inflict the damage on her Australian opponent, Tamika Saxby. Tamika’s agility kept her in every game and she almost snuck the third despite a collision between the two players at 6-6, resulting in Tamika using an injury timeout. Zeina was in no mood for a fourth though as she produce two outright winners to end the match from 9-9 and reach her maiden 10K final. The second semifinals between Nada Abbas and Defrawy started with a bang with Kanzy’s fan club, consisting of local junior players, parading her onto the court with music blaring. Unsurprisingly, Nada started a little nervously, but once she settled, she started to produce some excellent squash which led to the highlight of the night when Kanzy used her “Egyptian Magic” to dive and successfully retrieve three consecutive balls. Kanzy used a wide selection of shots and her experience to win the first two games, but the third proved to be her toughest test of the tournament so far. Nada was playing with great patience and extended the rallies which showed some vulnerability to the top seeds game. After surviving a game ball, Kanzy then dove again at 10-10 to set up match ball which was converted when Nada tinned a volley drop. Kanzy El Defrawy remains on course for her second PSA title in as many weeks with a straight forward, but highly entertaining match with Sadia Gul. Kanzy, equally entertaining off the court as he is on, produced another display of racquet wizardry that left her opponent scrambling for most of the match. Nada Abbas earned a semi-final berth with fellow Egyptian, Kanzy, after securing her first ever victory over compatriot Rowen Elaraby. The two 16 year olds both showed plenty of passion and at times desperation, as it became clear that neither player wanted to lose to their longtime rival. Nada took a 2-0 game playing with more freedom than her obviously edgy opponent. Rowan did mount a comeback but the damage had already been done as Nada produced maybe a shock victory, despite being the higher seed. The hopes of a US player winner the Gaynor Cup in the inaugural year ended when Haley Mendez succumbed at the hands of Tamika Saxby. It may have been more the legs than the hands that were the issue though as the game produced some grueling leg burner rallies. Haley snuck the first 12-10 and almost doubled her advantage after playing some quality squash to lead 11-10 in the second. Sport is all about moments, and for Tamika, hers was a volley boast winner off the return of serve that even the Egyptians have not dreamt up! Nobody saw it coming especially Haley and then two points later it was one game all. Tamika never looked back and the extra fuel in her tank seemed the difference as she gradually took control of the match to win in four tough games. Zeina Mickawy produced another solid performance taking out the second seed, Hollie Naughton. Hollie looked anxious in the first but settled herself to level the match, looking particularly good off the volley drops. 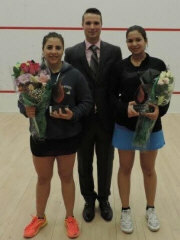 The pivotal third was neck and neck until 9-9 and was Zeina who produced the goods to close it out. This allowed the young Egyptian loosen up in the fourth and she raced to a 9-0 lead despite Hollie continuing to give it her all. The 3-1 victory sets up an encounter with Tamika, a player she has never encountered in her playing career. Seeds safely through in Cincinatti - well, almost! Day one of the Gaynor Cup was a fairly straight forward night for most of the seeded players with the only upset occurring in the first match of the night. Chloe Mesic, the fifth seed from France, came up against a rising star in Rowen Elaraby. 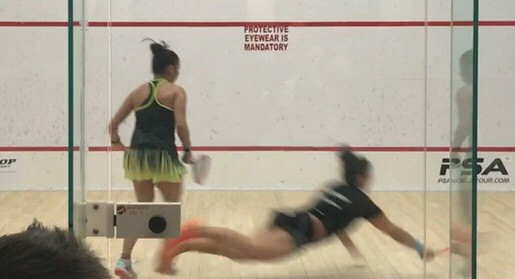 The Egyptian, a proven junior being a finalist at the World Junior Championships last summer, had a few too many tricks up her sleeve to disrupt Chloe’s game. She hit several disguised boast winners on the way to a 3-0 victory. Nada Abbas set up an all Egyptian sixteen year old clash with Elaraby in the quarter finals, taking out former World Junior finalist Weenee Low in three games. Weenee showed some great racquet work from days gone by to make the score line close but lacked a little sharpness in the physical arena to compete with her young opponent. 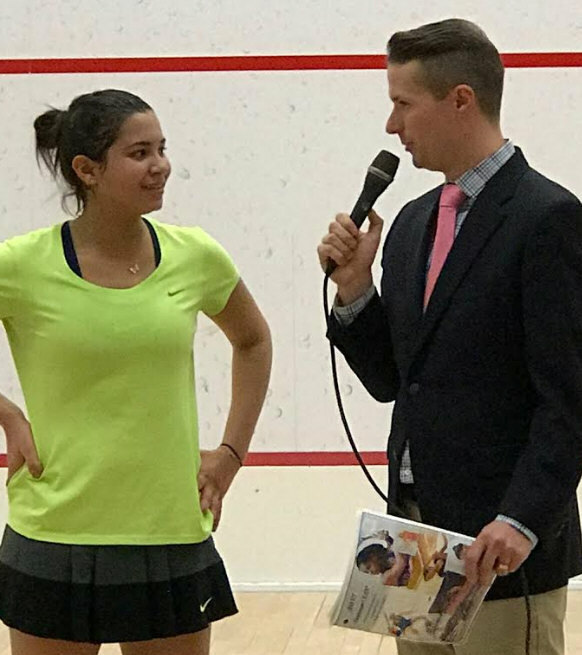 Top seed, Kanzy Emad El Defrawy, breezed through to the quarters, displaying some deft touch that will leave the rest of the draw fearful of her form given that she won in Delaware a week ago. Janet couldn’t get the Egyptian Magician off the T as she went down in three games. The last match produced the first fist pumps and vamos’s of the event as the crowd at the Cincinnati Country Club were treated to some drama and a 13-11 in the fifth score line. Sadia Gul was the victor to progress to the quarter finals and a stern challenge with the top seed, while Reyna Pacheco will be left to lick her wounds, maybe literally as the match turned into a rather physical affair. Points frequently ended in strokes with Sadia moving back into the path of the ball and power becoming the emphasis over the flair we had seen in the earlier matches. The bottom half of the draw was played at the T Squash Academy. 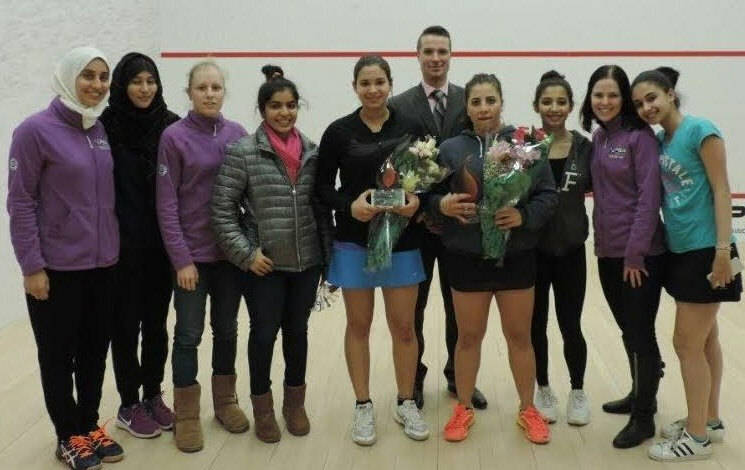 The match between Zeina Mickawy and Diana Garcia was high tempo affair with both players looking to volley as much as possible to assert court dominance. Diana took an early lead from a number of unforced errors from Zeina only to see the game slip from her grasp when Zeina ended it with 3 cross court nicks. Game two followed a similar pattern to the first with both players hunting the volley. Diana tightened up her straight hitting and fought point for point up to 7-8 again only to see Zeina close the game out with another 3 cross court nicks. In the final and closest game of the match both players matched each other point for point up to 8-8 before 2 tins from Diana gave Zeina 2 match balls which she converted at the second time of asking. Local pro, Amy Smedira, filling in last minute after a withdrawal, gave the locals something to cheer about when she tied the match at one game all with second seed, Hollie Naughton. Hollie always had the edge in the first as Amy tried to match her opponent’s intensity of pace. In the second game Amy quickly found herself with a 6-2 lead with Hollie showing a few signs of frustration after a couple of errors. Amy now playing with more confidence started to use more height and prevented Hollie from cutting the ball off as effectively. At 10-5 up, Amy almost let Hollie back in as she rushed to win the game. At 10/9, and after a long rally, Amy managed to glue a counter drop to the side wall to finally take it. Clearly frustrated with herself Hollie came out with more intensity in the third and fourth game. The physical effects of not training full time and winning the second were evident as Amy started to tire. Amy fought hard to the end but Hollie cut out the earlier errors and secured herself a place in the quarter finals. Tamika settled into the game very quickly looking to extend the rallies and test Farah’s patience. Farah struggled to start the points on the front foot allowing Tamika to control the pace of play which saw Farah turn too aggressive, hitting numerous tins. Speaking with her coach back in Dubai who was watching via Facebook, Farah started to find the back corners more often but only then to see her attacking shots absorbed by Tamika’s movement and she was unable to register a game on the board. Haley set up an intriguing match with Tamika in the second round with a very clinical performance from the 6 seed Hayley this evening. She set out playing a very controlled and methodical game and made light work of Thaisa. Thaisa fought hard in every rally to try and find a way to break Hayley but unfortunately there was no way through!